The Ex 4-piece is full on busy again. 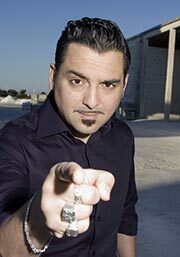 Since Arnold de Boer joined, the band has taken a major leap forward with a wave of inspiration, new songs and dozens of concerts. In October we toured Germany, France and Belgium, played at Han Bennink's book, "De wereld als trommel", and DVD, "Hazentijd", presentation in de Scheld'apen in Antwerp and at the opening of the new Magasin 4 in Brussels. In November we'll play in Germany and once again at the Unlimited Festival in Wels, Austria which is curated this year by Ikue More who first played with us in 1980 when she was in the legendary New York no wave band DNA. In December we play a weekend in France, including Ground Zero in Lyon. We're currently overloaded with future plans and possibilities :too many offers! - Jordan, Lebanon, Syria, Ireland, Japan, China, Ethiopia, Congo, Ghana, the Balkans, all Eastern European countries including Romania and of course the Western European countries, Scandinavia, US and Canada. And... we're slowly making plans for a brand new CD! 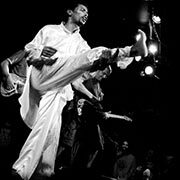 The Ex + Getatchew Mekuria + Guests were very busy in the first half of the year, playing many festivals : world music festivals such as the Fiesta in Sete (France), jazz festivals including Saalfelden Jazz (Austria) and rock festivals such as The Big Chill, near Bristol (UK). In September we did an amazing tour in Canada where we played the Guelph Jazz festival, celebrated the Ethiopian new year with two concerts in Toronto and ended with three gigs in one of our favourite venues in the world, the Sala Rossa in Montreal - two shows with The Ex + Getatchew and one improvised night of crazy combinations with all the band members. The band keeps developing and growing as Getatchew brings in new songs and with the addition of Addis Abeba based dancer Melaku Belay we'll definitely play more next year. Ethiopia Project part 3 : "Saxophones"
In the last week of December we organise the third "The Ex Presents In Ethiopia" project. The first, in January 2008 was with Amsterdam's electro-pop duo Zea, doing concerts, workshops, recordings and a videoclip. Last April we returned to Ethiopia with Silent Block from France - experimental electronica with three tables full of selfmade instruments, objects, contact-microphones and more. They made an amazing impact - people there had never seen anything like it! We also travelled south to Jimma and ended with a concert in the Hager Fekir Theatre in Addis Abeba with legendary singer Ayalew Mesfin joining in! December's project will be "Saxophones" with Chicago tenorist Ken Vandermark, Dutch reed man Ab Baars (ICP) and Friso Heidinga from Amsterdam Winds saxophone repair shop. 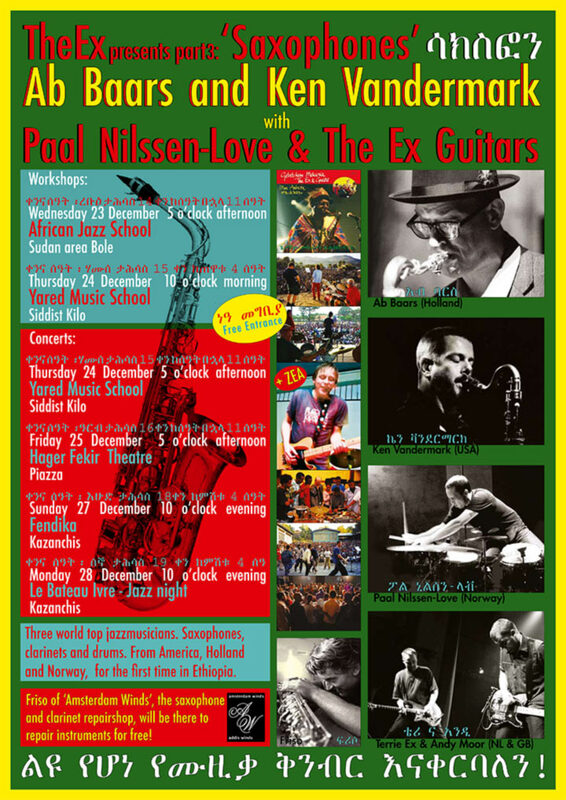 Ken and Ab will teach at the Yared Music School and there will be concerts together with The Ex, Norwegian drummer Paal Nilssen-Love and local Ethiopian musicians. Friso will spend his time in Addis repairing instruments for free and teaching people how to repair their own instruments. 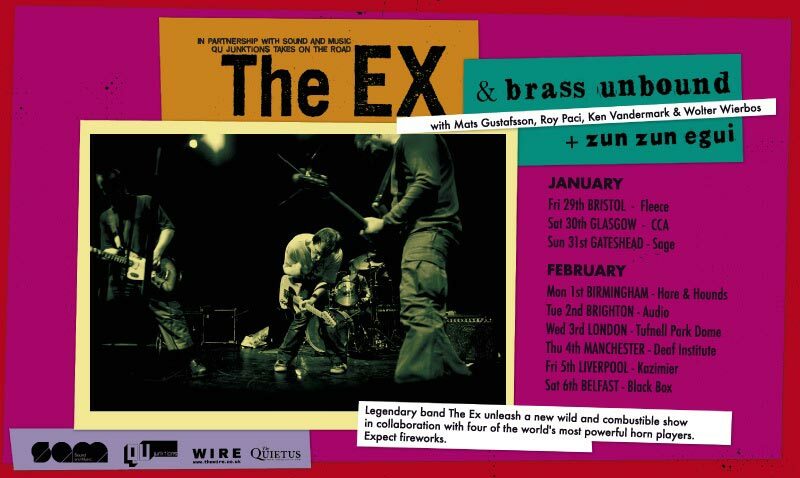 In late January, early February we will tour the UK with a new project called The Ex + Brass Unbound. On this one-off tour we plan to cut loose with a rhythmic and propulsive set, enlisting four world-class horn players to make up Brass Unbound: Swedish force of nature Mats Gustafsson (baritone saxophone), Chicago jazz heavyweight Ken Vandermark (tenor saxophone), Italian wild card Roy Paci (trumpet) and boundary busting classical futurist Wolter Wierbos (trombone). As players, improvisers and entertainers this group should nothing short of phenomenal. The music will be a mixture of completely new material and some recent Ex 4-piece songs rearranged to incorporate a wild brass section. The emphasis will be on playing a full-on set of energetic dance music with wide open structures and plenty of free improvisation. Expect fireworks! The tour is produced by Qu Junktions, a Bristol based agency with a great ear and diversity of taste, with support from Sound and Music. Support band on all dates will be Zun Zun Egui. Two remarkable films have recently appeared online. One, on Youtube, is very old footage, a song from our second concert ever on 22nd September 1979. We have no idea who put this clip up! 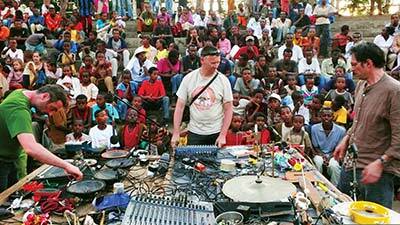 The other is from The Ex + Getatchew Mekuria concert in La Roche-sur-Yon on 7th August 2009, which was broadcast on the 8 o'clock news on TF1, the main French TV channel. 8 million viewers! WOW!!! For lots more Ex video material, check out our Youtube channel.